As much as I love sock yarn- I have an obsession with sock yarn, I also adore big fat chunky yarn. 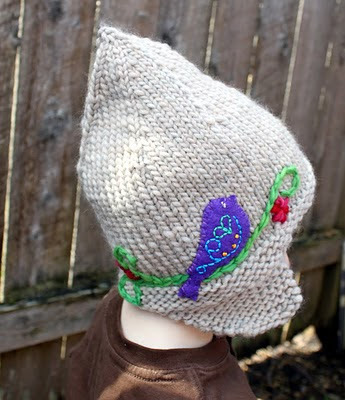 It's fluffy, it knits quickly and you can make some great projects with it. 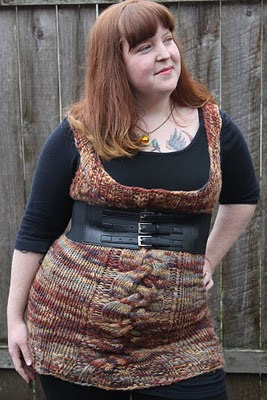 The only drawback is that if you don't use it correctly, big fat yarn can make you look big and fat in it. I recently knit some projects with bulky yarn. The first is a sleeveless long tunic by Wenlan Chia called Evening Shell. I was given some money for my birthday and promptly went out and fell in love with this yarn. It's spun as a thick and thin yarn meaning that thickness of the yarn changes. 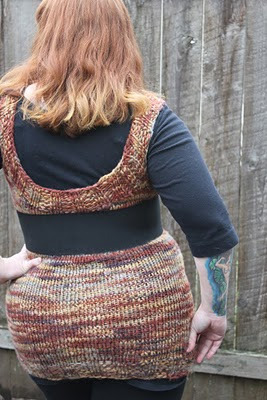 I absolutely love this tunic and plan on making another in cool colors. Maybe blue? I made quite a few modifications to the pattern. I had to change the amount of stitches I was knitting because my yarn was a different thickness, I used smaller needles and the largest size offered for the pattern is 30 inches. I also didn't knit the body of the tunic in seed stitch. I knit it in stockinette stitch since the yarn itself has a lot of texture. Plus seed stitch with bulky yarn is not flattering. I used four skeins of yarn for the main body and one for the neck and armhole shaping. The most recent chunky knit is Gnomey Hat. I had made this to fit an adult woman. But despite the fact that my gauge was correct the hat still ended up too small! It fits my 20 month old Silas quite perfectly. He already has a gnome hat so I am giving this to my friend Erin for her little girls in trade for some babysitting. This yarn is soft and is called roving yarn because there is a slight twist in it and is not plied. It feels like you're knitting with wool than with a strand of yarn. I wanted to add some sort of decoration to the hat and thought leaves would look nice. But on more consideration, I thought the leaves would make it look like elf ears. 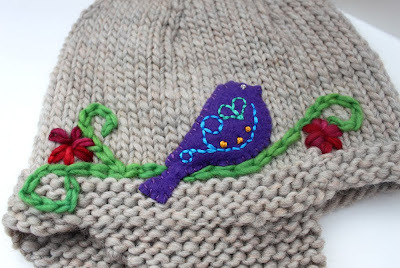 So I sought some advice from my awesome Knit Knackers and they suggested I put a bird on it! I embroidered the green branch and flowers with some leftover Malabrigo yarn I had. I cut the bird from a scrap of fleece I had and embroidered it with a little design. I love it and can't wait to see the little girls wearing it. I'll also be looking at other knitting projects wondering what I can embroider on them as well. Name: I Put a Bird On It!